My hunting partner Erik and I were slowly making our way up a sloped field when I paused and pulled out a box call. “Let’s find out if there’s anything over that hill before we crest it,” I whispered. I cranked on the box three times and almost immediately a gobbler boomed back from just over the rise. I hastily propped up a couple decoys, then Erik and I ducked into the adjacent woodline. We each found a suitable tree to lean against and I began calling. I hoped the calling would at least draw the bird to the hilltop and upon seeing the decoys, he would then saunter into bow range. As so often happens, however, Plan A didn’t work. As the gobbling faded off, I crawled up to the crest and peaked over the hill to learn the reason. The big tom was strutting for a group of hens. He already had what he wanted, and they were headed away. Plan B consisted of making a long, circuitous route, well out of sight and sound of the birds, hoping to beat them to where we thought they were going. The tom was still gobbling when we hit the adjacent field. Not wanting to be seen, I declined to put out the decoys. Erik and I settled into the brush along the field edge and I called again. And again the tom answered, only this time he was headed our way. The tom and I conversed for several minutes, me yelping and him gobbling back, each time sounding closer than the time before. Then it got quiet. I called and got no answer. I called again, and again no answer. This is one of those situations that can really test a turkey hunter’s patience, but you’ve got to stick it out. When a “hot” bird suddenly goes quiet it usually means one of two things. You hope that he’s quit gobbling, gone into strut and is coming in silently. I wish I had a dollar for every time I got impatient and moved too soon on a bird that went mum. The less desirable possibility is that something, or someone, spooked him. Erik and I sat tight for as long as we could. When I slowly eased up and peeked out into the field, the reason for the gobbler’s sudden reticence was revealed. Another hunter was walking across the open field. I was a bit chagrined, but those things happen occasionally. Maybe he just got impatient and moved too soon. My frustration turned to astonishment when I realized that wasn’t the case at all. He hadn’t just bungled out into the field. He was actually hunting; at least he thought he was. Like an upland bird hunter, he slowly worked his way along the field edge, gun at port arms and ready to shoulder should some unsuspecting turkey suddenly flush from the tall weeds. 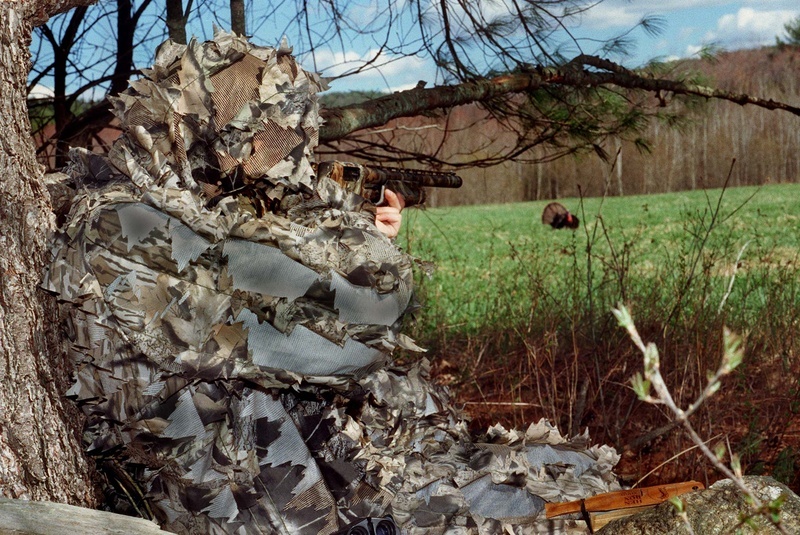 His turkey hunting naivete was further revealed by his dress. Aside from a camo shirt and hat, he was dressed as though he might have been on his way to work, and his pale, exposed face shone like a beacon in the morning sun. I’d taken for granted that most turkey hunters had at least some idea how to go about the sport. This guy obviously had no clue; and it made me wonder how many more like him there might be. Though turkeys are more akin to grouse, the hunting techniques used are far more similar to waterfowl. The basic premise of spring turkey hunting is to lie in wait, hoping to ambush a bird when it comes within range of your weapon of choice. The odds of that happening can sometimes be increased by calling, much as you would call ducks or geese. You don’t stalk turkeys, like you would a deer; and you don’t flush them, like a grouse, woodcock or pheasant. Neither technique is effective, and both could be potentially dangerous. Like waterfowl, turkeys have extremely keen eyesight and excellent color vision. That means you should be camouflaged from head to toe, and remain as motionless as possible. It’s particularly important that you cover your face and hands, which means gloves and a face mask. Even with the best camo, turkeys will still pick out movement. Something as simple as moving your finger to click off the safety, or a slight turn of the head can be enough to send them fleeing. Calling can help, and the more you know about turkey calling the better the odds. Still, being in the right place is equally, if not more important to your success. That’s where scouting comes in. Study the birds you hunt and try to learn their routines, if they have any. Enter and leave the woods and hunt in such a way that you don’t reveal your presence, and they might stick to those routines. Walk around in the open and you only make it tougher on yourself and everyone else. These are only the very basics of turkey hunting. If you want to have a safe, successful and enjoyable experience, you should learn as much as you can before you hit the woods.